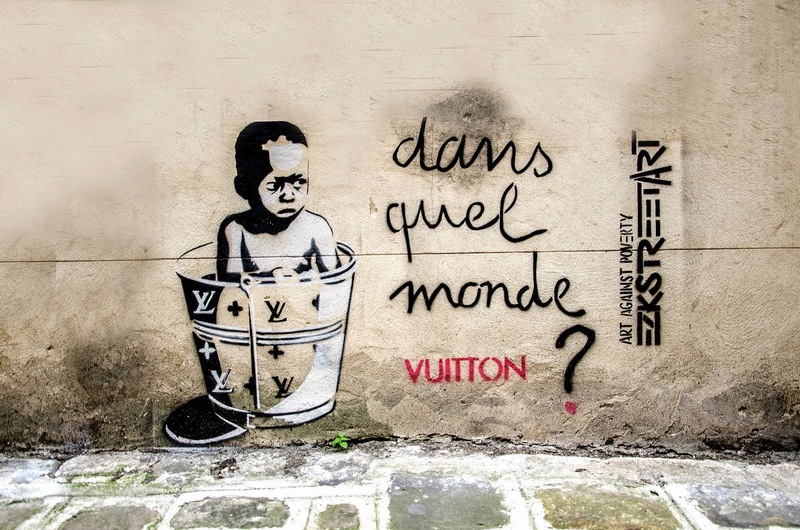 If you don't speak French it's unlikely that you will be able to understand the play on words in this graffito: "Dans quel monde Vuitton?" sounds like "Dans quel monde vit-on ? (In what kind of world do we live?). You can also see the Louis Vuitton monogram (LV) on the bucket in which the child is sitting. As you guessed the aim of this clever piece of art is to condemn poverty and the difference between the ones that can buy Vuitton suitcases and the ones that can't. Apparently this artist even belongs to a group called "Art against Poverty" (it's written in the vertical graffito). Beyond the political message, I thought the piece of art was pretty good. Quite stark. It does stand out well. Well done! I would say that the artist is African, since Art Against Poverty is based in Kenya and Tanzania (but he or she must speak French very well).